Lawrence M. Clark is an Associate Professor of Mathematics Education at the University of Maryland Center for Mathematics Education. He obtained his bachelor’s degree in mathematics from Hampton University, and M.Ed. and Ph.D. degrees from Emory University. Prior to joining the Maryland faculty, Dr. Clark was a postdoctoral research fellow at the Center for Proficiency in Teaching Mathematics at the University of Michigan. While at the University of Michigan, Dr. Clark was a member of the research team for BIFOCAL, a professional development project designed to enhance middle grades teachers’ capacity to select and facilitate cognitively demanding mathematics tasks. 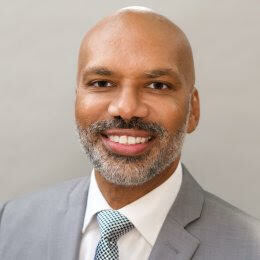 Prior to his appointment at the University of Michigan, Dr. Clark served as the National Director of Mathematics for Project GRAD USA, a national school reform initiative in several urban school districts. Dr. Clark is currently PI of the NSF-funded University of Maryland Noyce Math Scholars Program and co-Pi of the University of Maryland Noyce Science Scholars Program. Dr. Clark is also currently a Research and Development Fellow for the NSF-funded TheMAT project (Dan Chazan and Patricio Herbst, PIs). Dr. Clark has experience as a mathematics teacher educator in the U.S., Ethiopia, Ecuador, and Kenya. From 1992 – 2000 Dr. Clark taught middle school mathematics in Atlanta, GA. Dr. Clark’s research interests focus primarily on examining and exploring influences on teachers’ mathematics instructional practice in schools with a history of low achievement. These influences include teachers’ mathematical knowledge, teachers’ beliefs, and teachers’ explicit and implicit biases. Dr. Clark has also written book chapters and journal articles focused on the role of African American mathematics in the lives of African American mathematics learners.